The original deck railing was too low to meet the building code. The large back deck was one of the things that attracted us to the house. Our home inspector warned us that the railing was too low to meet code but he missed the fact that the rest of the deck was not built properly– something we later figured out on our own. 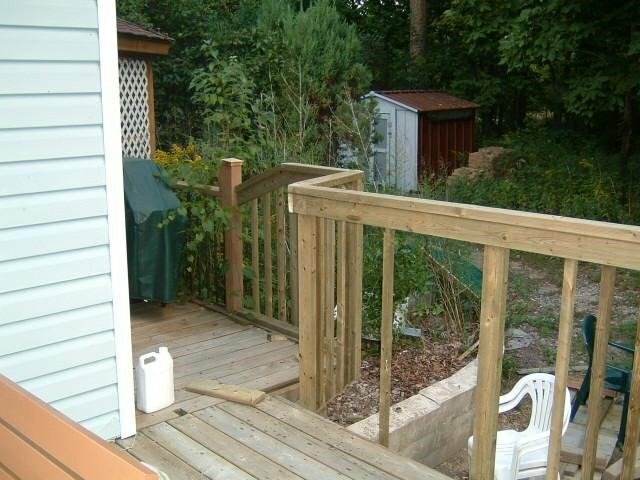 The deck is attached to the family room addition, which is also in need of a tear-down and rebuild, so we did not want to waste money putting up a new deck. The railing, however, needed to be replaced. 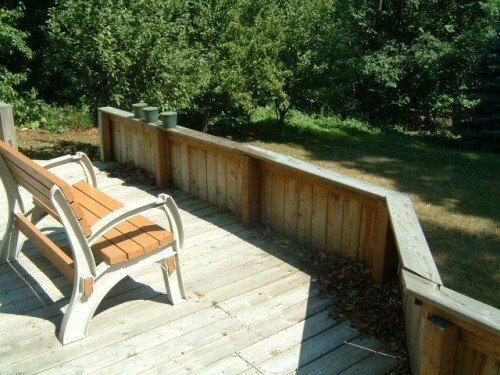 The deck railing was obviously not close to meeting code. The previous owner kept it low, apparently to take advantage of the views of the sloping backyard and neighboring woodlots. But once our daughter grew taller than the two foot high railing, we were no longer willing to compromise safety. The demolition was rather fun. I knocked out all the deck boards forming the wall, and then used a reciprocating saw to cut the posts down level with the deck. With no railing in the way, I was able to easily wash the deck to give it a new lease on life. Washing the deck was easy with no railing in the way. The tops of the posts were coated with an end cut preservative, since they would not be covered. 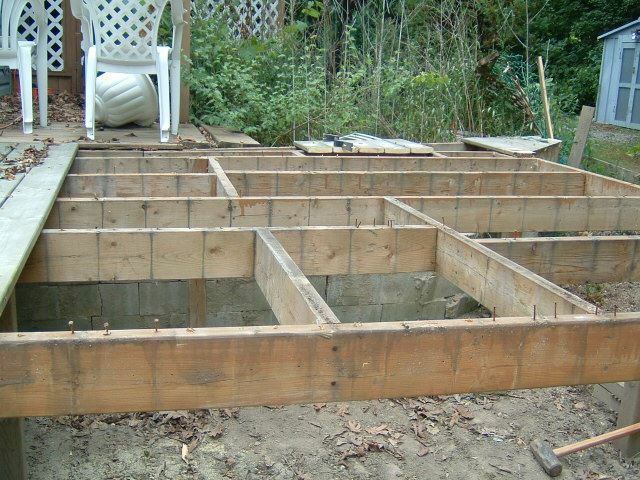 Ideally, they would be covered by the deck boards, but I was not about to start restructuring the rest of the deck. As it was, the railing was expensive enough, and we were only looking to get a couple more years out of the deck. Some of the deck structure was suspect, so I ended up removing part of it. 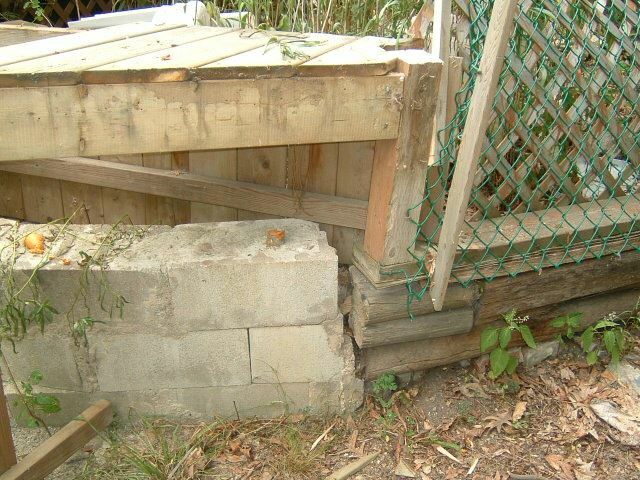 At one end the deck was supported by a 4×4 resting on a retaining wall made of railroad ties that were rotting and falling over. 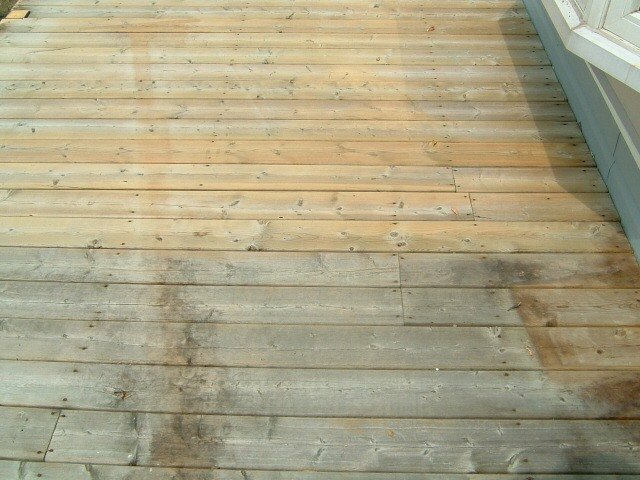 Safety aside, another advantage of removing this section of deck is that it saved me money on materials. Smaller deck equals less railing. I kept the design of my new railing simple and affordable. 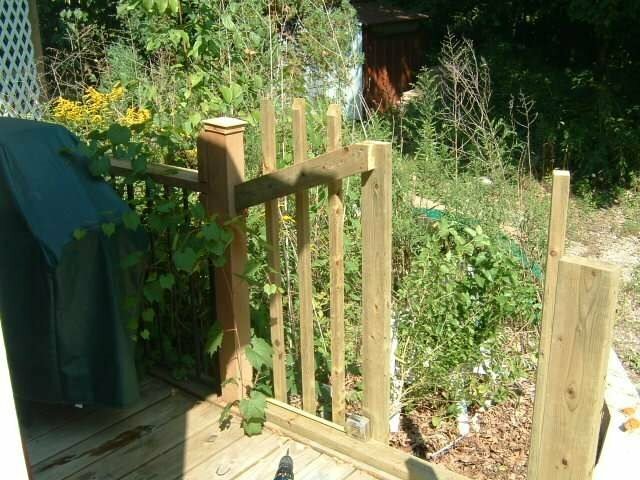 I wanted the railing to be 44 inches high as the drop from the deck to the ground measures as much as four feet. 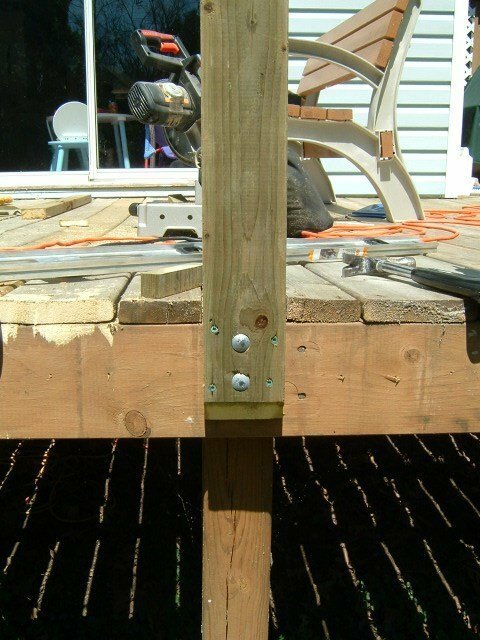 I used galvanized carriage bolts to attach 2×4 “posts” to the 4×4 deck posts. Deck screws held the post in place while I drilled the holes for the bolts. I used four screws and two bolts for each post. All the posts were cut the same length. 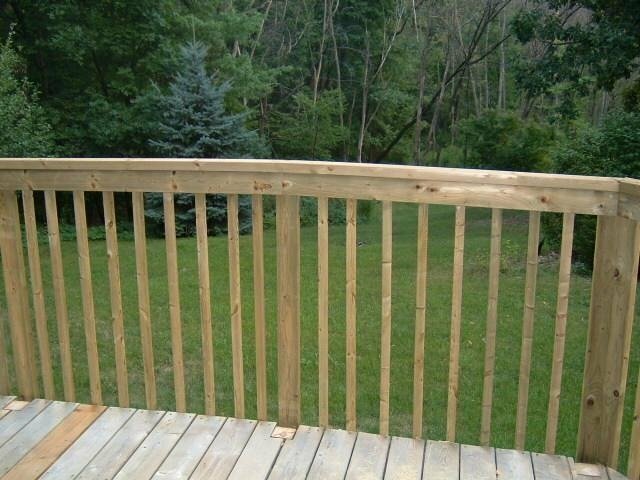 The railing is the same height at all points around the deck. 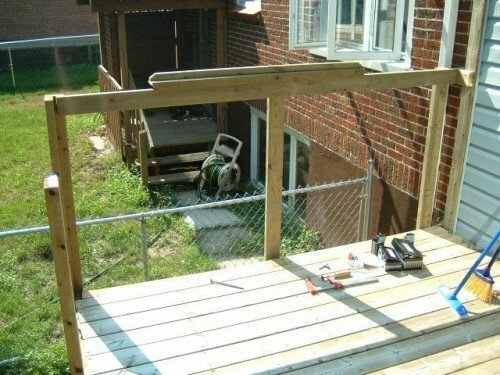 The deck is not level so the railing was not going to be level. The next step was to install a two by four rail which I attached to the posts using deck screws. The top rail is attached on the inside. The 2×4 top cap was installed next. I left a one and a half inch overhang on the outside, the same thickness as the balusters. A small overhang on the inside creates a nice character shadow. The 2×4 “post” is attached to the deck post using carriage bolts. 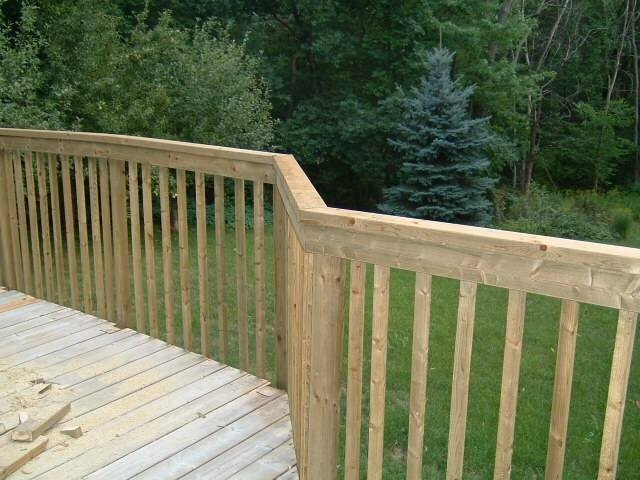 The outer view of the deck railing structure. The railing structure as seen from the deck. 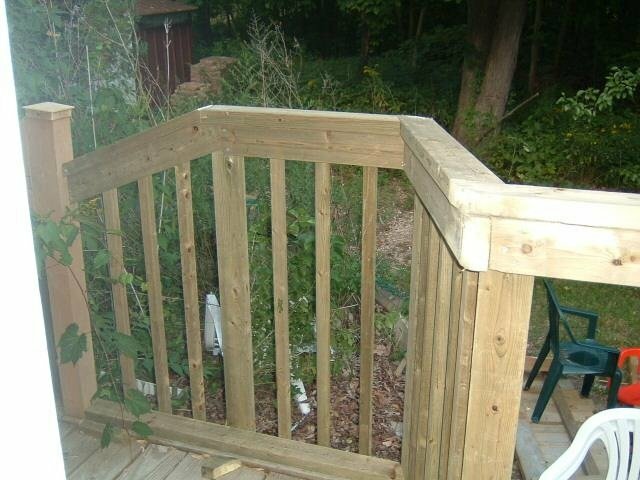 The deck railing with the balusters and top cap in place. The balusters are the common ones found at any lumber store– 2×2’s with tapered ends. These are attached to the top rail and to the deck skirt using deck screws (two at the top and two at the bottom). I took my chances by not drilling pilot holes and ended up splitting a number of baluster costing me money and time. Guaranteed Equal spacing between balusters every time– no math involved! To space balusters equally, Tom Silva of “Ask This Old House” uses a piece of elastic waist band material, available at fabric stores. On it he made a series of marks two inches apart. When stretched out, the marks stay evenly spaced. Now the elastic can be stretched out so the marks are close to four inches (or any other desired spacing) apart. This works well when the marks can be transferred to the top and bottom rail at the same time. It is necessary to have a helper since it takes two hands to stretch the elastic and another hand to make the marks. This method is virtually error-proof, since no numbers or calculations are involved. 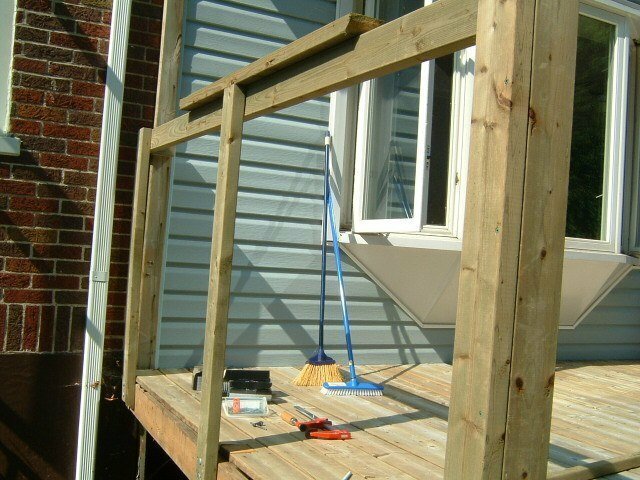 Making the transition to an existing railing at the side of the house wasn’t too difficult. I simply cut off the balusters using the reciprocating saw. The funky angles for the top rail and capping were achieved through trial and error and whole lot of tweaking. It would have been a lot more difficult to miter the angles. Although it doesn’t look as nice, a simple trim with the reciprocating saw made my life easier. For this slope, the balusters were installed before the top rail and then trimmed. Looks pretty good, if I do say so myself. The finished railing looks a lot better than the solid two foot high wall that it replaces. We have a better view of our yard through the railing (as opposed to over a wall) and the structure is sturdy and safe. The new railing: safety with a view.